- A 1957 live performance from Stuttgart, conducted by Lovro von Matacic. 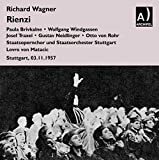 - The great Heldentenor Wolfgang Windgassen stars as Rienzi. - Stuttgart came to be known as the 'Winter Bayreuth' for its staging of Wagner operas not slated for performance in Bayreuth.